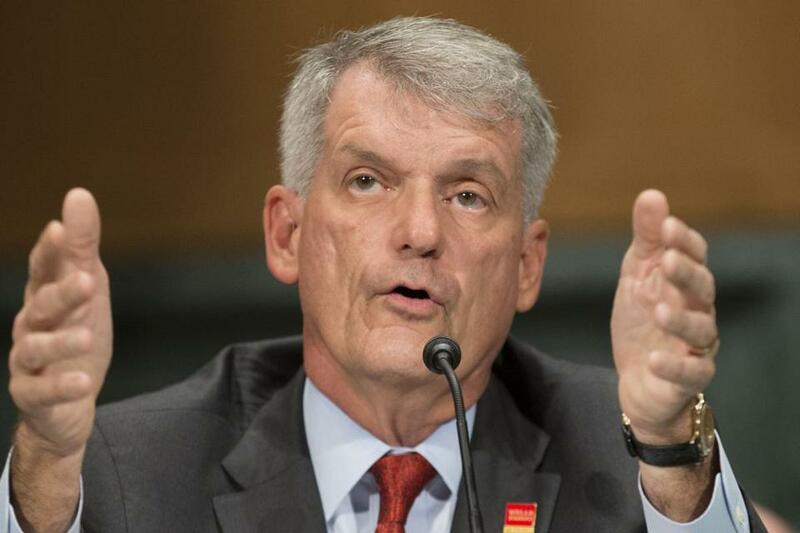 Wells Fargo CEO Tim Sloan testified before the Senate Banking, Housing and Urban Affairs Committee Tuesday. NEW YORK (AP) — Wells Fargo’s chief executive faced an angry Congress on Tuesday, saying yet again that the bank remains ‘‘deeply sorry’’ for its previous sales practices, and that since the scandal over them exploded it has substantially changed for the better. Tim Sloan appeared in front of the Senate Banking Committee in Washington, D.C., about a year since his predecessor did the same and was grilled about the sales practices that led employees to create millions of accounts without customers knowing about or authorizing them. ‘‘I apologize for the damage done to all the people who work and bank at this important American institution,’’ Sloan said. Wells Fargo has said that 3.5 million accounts were potentially opened without customers’ permission between 2009 and 2016. People may have had different kinds of accounts in their names, so the number of customers affected may differ from the account total. Despite his apology, Congress remains united on at least one thing: It’s angry at Wells Fargo. ‘‘At least, we are irritated at Wells Fargo,’’ said Senator Tim Scott, a Republican from South Carolina. Democratic Senator Elizabeth Warren of Massachusetts, a vocal critic of Wells Fargo, called for Sloan’s firing. ‘‘At best you were incompetent, at worst you were complicit,’’ in the sales practices, Warren said. The scandal was the biggest in Wells Fargo’s history. Sloan’s predecessor, John Stumpf, testified twice in front of Congress last fall. His poor performance was widely chastised, and the scandal led to his ouster. The bank’s once-sterling industry reputation was in tatters, and it ended up paying $185 million to regulators and settled a class-action suit for $142 million. Democrats are using the hearing to defend the Consumer Financial Protection Bureau, which has been strongly criticized by Republicans over new regulations it created over what’s known as forced arbitration. That’s when a company requires a customer to use a private arbitrator to resolve disputes instead of filing a lawsuit. Sen. Sherrod Brown, D-Ohio, explicitly asked Sloan whether if Wells would give up its tactics of using arbitration to resolve disputes, to which Sloan responded with a curt, ‘‘No.’’ Wells has been one of the biggest users of arbitration clauses in its products. Even as Wells has tried to make amends over the past year, other issues have surfaced. That includes the revelation that hundreds of thousands of customers were signed up for and billed for car insurance that they didn’t need or necessarily know about. Wells Fargo is also still under several investigations for its sales practices problems, including a congressional inquiry and one by the Justice Department. Senators on both sides of the aisle expressed their continuing disappointment Tuesday as CEO Tim Sloan appeared before them, wondering whether one of the nation’s largest consumer banks has truly changed its culture a year after the sales practices were exposed. Wells Fargo has said that 3.5 million accounts were potentially opened without customers’ permission between 2009 and 2016, as employees tried to meet ambitious sales targets. Sloan’s predecessor, John Stumpf, testified twice in front of Congress last fall and the scandal cost him his job. Senator Tim Scott, a Republican from South Carolina, said, ‘‘We are irritated at Wells Fargo. Democratic Senator Elizabeth Warren of Massachusetts, a vocal critic of Wells Fargo, called for Sloan’s firing. She said, ‘‘At best you were incompetent, at worst you were complicit,’’ in the sales practices.